Many guests at the Bienville House feel that they’re visiting a centuries-old French Quarter manor house rather than an upscale boutique hotel. After just two short years the building was sold in 1937 and split into a small boarder hotel and a Fire House. During the revival of Decatur Street, the building was remodeled into 20 luxury apartments named Royal Bienville. In the early 1970’s the Bienville narrowly escaped destruction by a nearby fire that destroyed several neighboring buildings. The building was restored to a hotel again and served as a “motor hotel” appealing to people driving to or through New Orleans. In 1972, the Monteleone family purchased the establishment. The Bienville House Hotel joined the Hotel Monteleone as family owned and operated historic hotel. After countless transformations and a nearly disastrous fire, the Bienville House has the look and feel of a centuries-old French Quarter manor house. The European style hotel features wrought iron balconies off of guest rooms, welcoming sundecks, and a flag stone courtyard surrounding the crystal blue lagoon pool. Ample in-room amenities make the Bienville House a luxurious retreat from the hustle and bustle of the French Quarter. Surrounding the beautiful Bienville House are the antique shops of Royal Street, the late nights of Bourbon Street, the blues and jazz of House of Blues, the intrigue of voodoo and ghost tours, the history of Jackson Square, and world class dining of culinary New Orleans. The Bienville House Hotel is the perfect destination to experience the sights, sounds and soul of New Orleans. 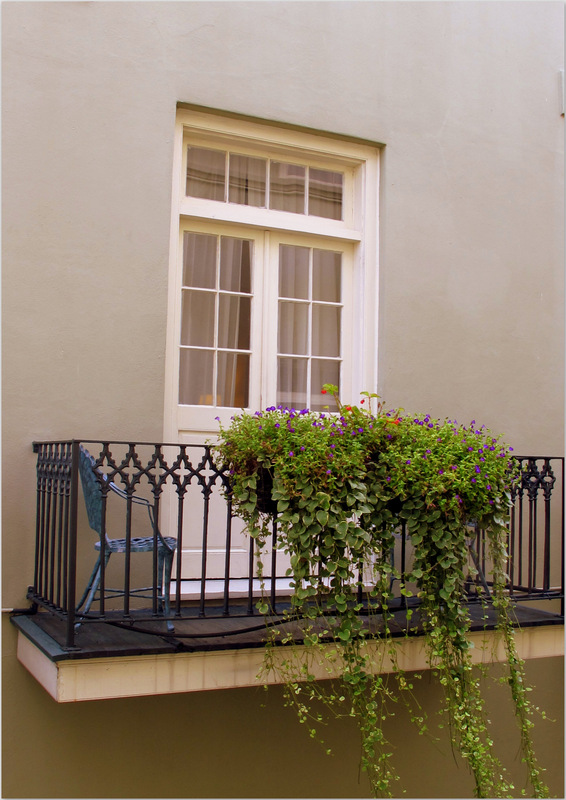 Just as the French Quarter is perfectly situated in the heart of New Orleans, the Bienville House Hotel is perfectly situated in the midst of the historic French Quarter. Having just completed a multi million dollar renovation, the 83-room hotel is a truly distinctive establishment with a sense of style and grace only to be found in America’s most interesting city. The lobby, reminiscent of a French Quarter parlor, is elegantly appointed with hand-painted murals and Old World furnishings. A flagstone courtyard surrounds a crystal blue pool, wrought iron balconies grace many guestrooms, four welcoming sundecks invite you to relax and drink in the flavor of the most European of cities. Guests will delight in a host of luxurious in-room amenities that make your hotel room a welcome respite from all the bustle of the French Quarter. Guests at the Bienville House will also find themselves in a prime location, amidst the city’s finest antique shops on Royal Street, Bourbon Street, late-night jazz clubs, world renowned restaurants, centuries-old historic buildings, museums, voodoo shops and more. 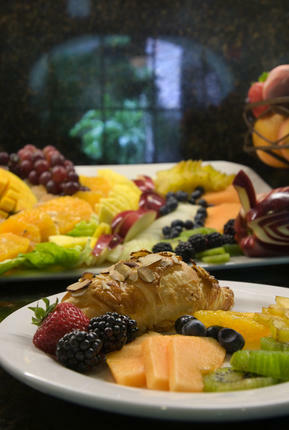 Bienville House Hotel is the closest French Quarter hotel to Saks Fifth Avenue, the Aquarium of the Americas, Woldenberg Park, Entergy IMAX Theater, the House of Blues, and only steps from Cafe Du Monde and Jackson Square. Whether you’re looking for a family-friendly hotel, planning a romantic getaway, or attending a corporate retreat, the services and amenities at Bienville House will ensure a comfortable and pleasurable stay. Our exceptional service and friendly staff have made us a popular French Quarter destination for couples, families and business travelers.Our guests enjoy amenities that provide all the comforts of home in a historic setting, allowing you to enjoy our local attractions right outside your doorstep. 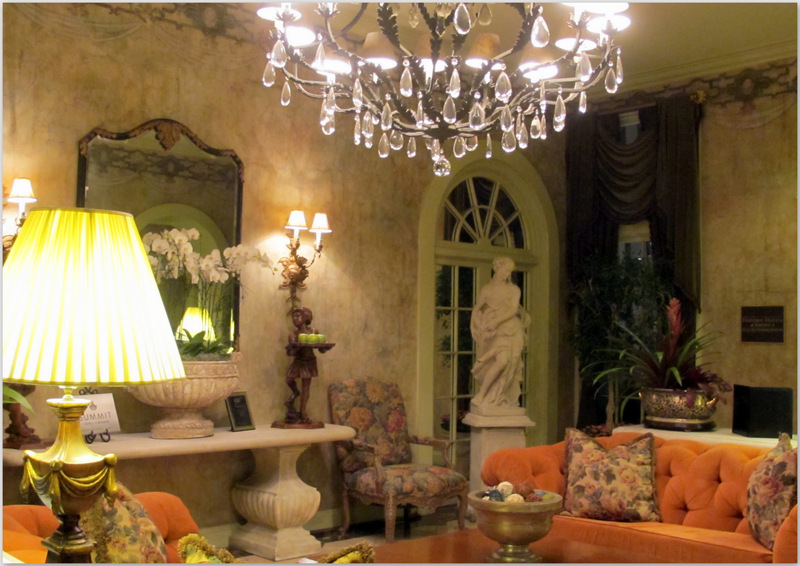 Bienville House Hotel is a place like no other, one you will want to visit again and again. Come experience it for yourself. The guestrooms at the Bienville House offers Gilchrest & Soames bath products and cosy bathrobes. The Bienville House offers 83 luxuriously appointed guestrooms, including 3 suites, that offer all the comforts of a New Orleans boutique hotel. Amenities include air conditioning, down pillows, voicemail, cable/satellite television, video games, wake-up calls, designer toiletries, and shower/tub combination. Cribs are also available. Delight in these enchanting interior king rooms　that feature　mahogany rice-carved four-poster beds. Enjoy the serenity of a windowless room. To help guests feel at home, each room is equipped with 300-thread-count triple sheeting, beveled mirrors, luxurious bathrobes, clock radio with ipod® player, in-room safe for laptop, complimentary morning newspaper, wireless Internet access, designer toiletries, and work desk and chair. Rooms are approximately 280 square feet. Deluxe rooms feature a view of the street or courtyard　with either　mahogany rice-carved four-poster king-size beds or two double beds. Rooms are equipped with 300-thread-count triple bed sheeting, beveled mirrors, luxurious bathrobes, clock radio with ipod® player, in-room safe for laptop, complimentary morning newspaper, wireless Internet access, designer toiletries, and work desk with chair. Rooms are approximately 300 square feet. 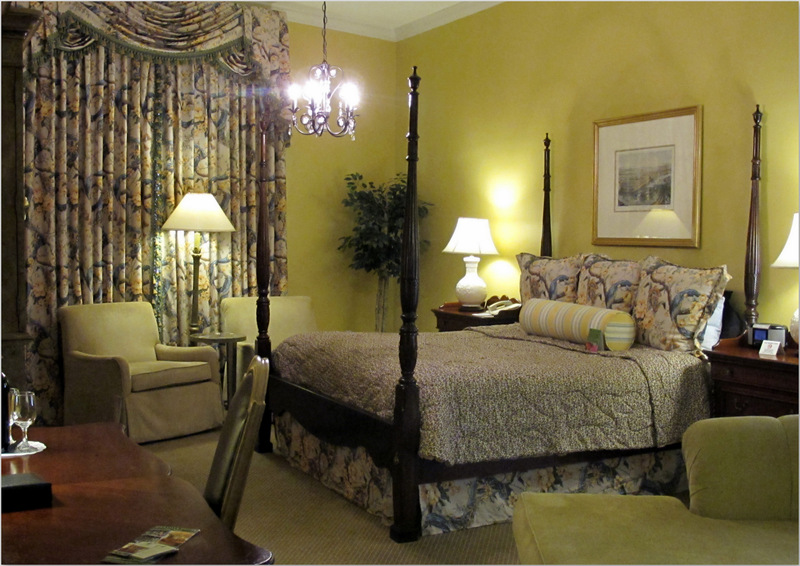 Superior rooms feature two double beds or a king-size four poster bed with a private balcony. Each room includes 300-thread-count triple sheeting, beveled mirrors, luxurious bathrobes, hairdryer, clock radio with ipod® player, in-room safe for laptop, complimentary morning newspaper, wireless Internet access, designer toiletries, and work desk with chair. Rooms are approximately 350 square feet. Oversized guest room features mahogany rice-carved four-poster king bed and private balcony.To help our guests feel at home, each room is equipped with 300 thread-count triple sheeting, beveled mirrors, coffee/tea maker, luxurious bathrobes, hairdryer, clock radio with ipod player, in-room safes for laptop, complimentary morning newspaper, wireless internet access, voicemail, cable/satellite TV, designer toiletries and work desk with chair. The popular and cozy restaurant Iris, has changed locations to a larger, more spacious fine dining establishment at The Bienville House Hotel in the heart of the French Quarter. Owner-Chef Schnoebelen’s unpretentious, new American cuisine concentrates on fresh, seasonal ingredients presented in inventive ways while blending French and Italian dishes seamlessly with his southern California roots. The flavors are bright and the flair is light, counterbalancing the heavy cuisine frequently found in the Crescent City. 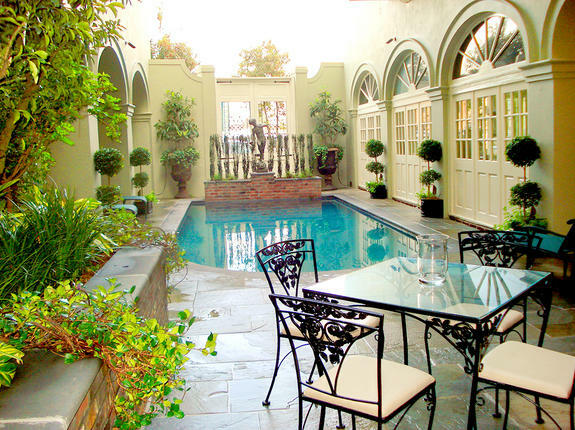 Bienville House Hotel features an outdoor, salt-water swimming pool surrounded by a lush courtyard. Amenities Include: Air conditioning, Complimentary breakfast, Coffeemaker, Iron / Ironing board, In-room safe, Alarm clock, Desk, Climate control, Complimentary newspaper, Robes, Crib (On request), Daily maid service, Wheelchair accessible, High-Speed Internet access (For a fee), Wireless Internet access (For a fee), Hair dryer, Combined shower and bathtub, Complimentary toiletries, Flatscreen television, Cable / Satellite television channels, Pay-Per-View movies, Radio, MP3 player docking station, Telephone, Voice Mail, Wake-up Calls, Premium bedding. wow! what a nice place to stay in. Full of romance. Lovely hotel, wish I have time to stay and explore this place…I love the pool! Hotelnya klasik banget ya mba? Bagus, bikin tamu betah nih. Mahal ngga? Destinasi yang unik nih. The big easy, new Orleans adalah kota menarik untuk dijelajahi kalau kota besar seperti LA dan NY sudah biasa. Butik hotel seperti ini yang unik daripada hotel chain. Setuju! I stayed at Bienville Boutique Hotel for 2 nights. Absolutely marvelous! I love the classy suite room with elegant furnishing and also the balcony!. The location was perfect, just a walking distance to get fabulous restaurants, shops and some main attractions in Decature Street, French Market and Bourboun Street. The breakfast was very nice as it included a variety of basic items, while we enjoyed it at court yard with stunning view of greeny pool. Needs more time to explore New Orleans and we will be back for sure! Who Dat? !